a. Cutting the redd. The females excavates with her caudal fin the bottom of the river in the place where she will lay her eggs. (we have over 200 "cuttings" including the trout ones). c. Attacks. During the courtship we have numerous attacks from males to males, females to males , adults from both sexes to juveniles (precocious parr ) and attacks between juveniles. d. Spawning. The dominant male and the female quivers with their jaws opened (gaps) while realising the sperm and the eggs, during that other satellite males and also some juveniles also join the pair trying to fecundate the female eggs. Until today we have three Atlantic salmon"spawnings." 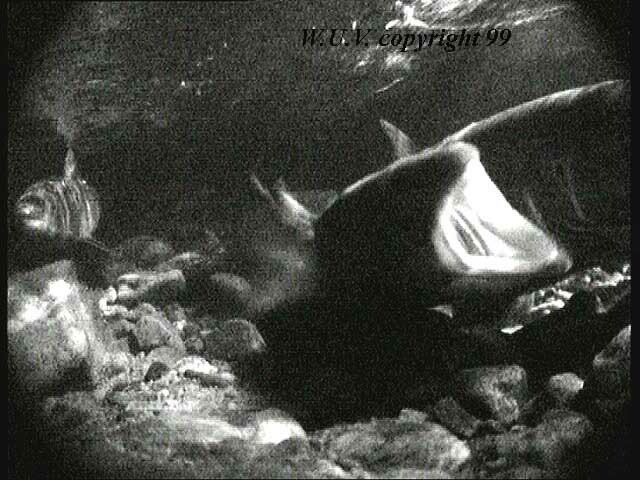 We recorded the firsts two in 1997 in the River Nansa (Cantabria) with the help of Dr. García de Leániz fisheries team. The last one was recorded during November 1999 in a small tributary to the Findhorn river in the Scottish Highlands. It has the particularity that it was recorded during night hours with a black and white camera lighted by an infrared beam. e. We do also have images from aquariums showing egg (eyed and green) and alevins with and without the yolk sac. Other than that we do have images of other river inhabitants, including a total of 29 different species. We do also have a wide still and video archive of wildlife.